“The Just Rais’ It” Concert is in full swing with Blue Fringe, Eli Gerstner, Mendy Wald, Yaniv and the Heedoosh Band, Shloime Kaufman… The auditorium at Ramapo High School in Monsey is rockin’ with the cheers of close to 800 people, the children dancing in the aisles, the boys doing flips in front of the stage, the crowd goes wild when Blue Fringe substitutes “Monsey” for Teaneck in the Shidduch song… everyone is swept up by a feeling of Achdus that can only come from the power of giving, of coming together for Chai Lifeline’s kids! 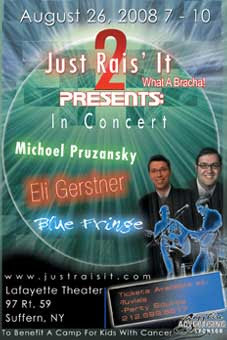 Get your tickets for the concert, put an ad in the journal, make a donation to Chai Lifeline, or be a Concert Sponsor… on our website www.justraisit.com! Or You can call or email: 845-598-6196/ justraisit2@yahoo.com.